Nine Elms is traditionally thought of as an industrial area. Battersea Power Station is nearby, it has been a region of gasworks, waterworks and railway repair yards, and Vauxhall Motors began life here before relocating to Luton. It wasn’t always that way. The area got its name in the seventeenth century from a population of elm trees. The Thames occasionally overflowed into the fields here, and in the middle of the nineteenth century it was mostly windmills and pollarded willows. Even when the railway came, passengers travelled on to London Bridge by boat. Now, Nine Elms is changing once more. 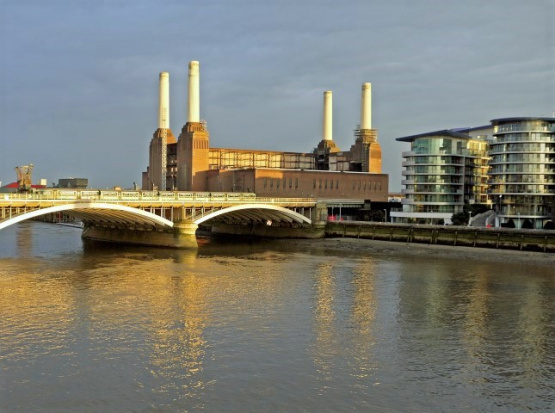 Battersea Power Station is being redeveloped, with homes and apartments, office space and leisure facilities, hotels, and a broad mix of restaurants, cafes, and shops. There will be a 'linear park' – an area free of all cars that stretches from the power station to Vauxhall Cross, with access points to the Thames River Path. London has been slower than many river-based cities to fully grasp the pleasure a developed riverfront can give residents, but it’s catching up fast. £40 million is now being spent on a pedestrian-only bridge from Vauxhall to Pimlico. The area will also become something of a diplomatic enclave. The US Embassy and the Embassy of the Netherlands are both relocating here, while the Chinese Embassy is said to be planning to follow suit. And then there’s the potential influx of high tech companies likely to follow Apple, who are moving their HQ from Regent Street and putting their 1,400 employees into half a million square feet at the remodelled power station. That’s enough space to more than double Apple staff numbers in the next few years, confirming post-Brexit interest in the UK as a base for global IT companies. Does that mean Wandsworth in general and Nine Elms in particular is set to become the relocated heart of IT in Britain – a Silicon Borough? Yes, it probably does. And the benefit to all residents is clear. That sort of influx (the council forecasts 25,000 new jobs in the area) brings prosperity, with education and work opportunities. The fact that some of the high-end homes and apartments will bring in wealthy new residents from widely differing lands carries with it a special kind of advantage: a cosmopolitan population brings cosmopolitan food stores, restaurants, and attitudes. So, while Londoners may not in the past have picked out Nine Elms as an upmarket area, it was ripe for redevelopment. Now, its future is surely bright.